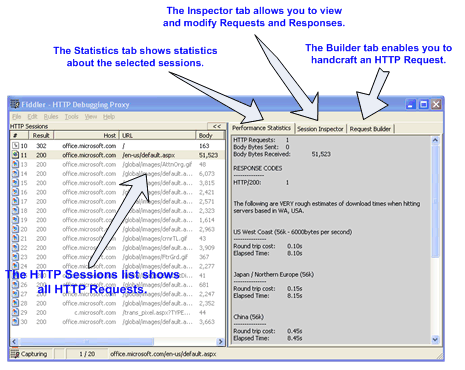 The Web Sessions list contains the list of HTTP Requests that are sent by your computer. You can resize and reorder the columns in this list for your convenience. You can also sort this list by clicking on the column header. Result - The Result code from the HTTP Response. Custom - A text field you can set via scripting. In Fiddler v2.2.0.5 and later, you can add new columns of your choice. The default text coloring of the Session entries derives from the HTTP Status (red for errors, yellow for authentication demands), traffic type (CONNECT appears in grey), or response type (CSS in purple, HTML in blue; script in green, images in grey). You can override a session's text color using the ui-color flag in FiddlerScript. Session was aborted by the client, Fiddler, or the Server. Tip: You can add to this menu using the ContextAction feature of FiddlerScript. Session > In ArchiveZIP - Creates a .SAZ archive containing all selected requests & responses, plus an index page. The Inspectors tab allows you to view the contents of each request and response, in a variety of different formats. You can develop custom Inspectors using .NET. The Timeline Tab shows the transfer timeline of selected HTTP Sessions.